Have you ever found yourself going round and round in circles when trying to help your child with math homework? You’ve checked the example, asked your child how the teacher explained the work in class, and even resorted to teaching the topic from scratch.Yet your child doesn’t get it! We’ve all been there! As a math teacher, math blogger and lover of math, here are a list of strategies that I use as a parent and a tutor to help my kids build a strong foundation in math and beat the math homework blues! Dig out those emails from your child’s teacher and see if you’ve been given a list of topics that your child will learn over the week, month, semester or year. That way you’ll at least be able to mentally prepare in advance for tricky topics. If you can’t find the information from the school, see if you can find the list of topics online for your child’s state. Another tip is to go to the bookstore, brick-and-mortar, or online and check the contents pages for workbooks for your child’s grade level. When looking at a particular topic. It’s often a good idea to check that your child is confident with that topic at previous grades levels too. For example, if you’re child is struggling with long division, check to make sure they know their times-tables and division facts and are also strong at multi-digit subtraction, all skills necessary to confidently tackle long division. Do lots of research. There are some great Facebook groups and pages that highlight tips and articles that you can use at home to help with your child’s math homework. You can also head on over to websites and blogs aimed at teachers. Look out for lessons that can be modified for use with just a few children. You should also check out the Bedtime Math website for daily short math story problems. A great resource for building up story problem skills. Pick resources that suit you and your child. You’ve each got your own strengths and weaknesses, so if your child has been at school all day, where they are likely to have done lots of writing, don’t expect them to happily do lots and lots of worksheets. Maybe pick something that’s an app or a printable board game or just some oral questions. If your child is a fan of Lego, look for math resources and activities with that theme. There are also some great websites that highlight cool “real life” math problems such as “Which Pizza Deal is Better”. Which Pizza Is A Better Deal? The final tip is to learn with your child. If you need to help your child with the addition of fractions with different denominators, then go through the process of actually learning how to add fractions with different denominators with your child from scratch. Google “Adding fractions with different denominators Common Core grade 4” and see what videos and/or images available. Select a few and share them with your child, telling them “Look I’m not really sure about this, but let’s learn this together.” Move away from the “I know everything and you know nothing” situation, and move towards an “OK – there is a problem here. Let’s figure this out together.” situation. By narrowing down math topics to work on, researching and bookmarking articles and tips and learning alongside your child, you’ll soon be well on your way to beating the math homework blues. Caroline Mukisa is a coach at Thinkster Math – a math program that offers a unique blend of AI and human intervention. She shares advice to help parents support their kids’ math on her Maths Insider website. 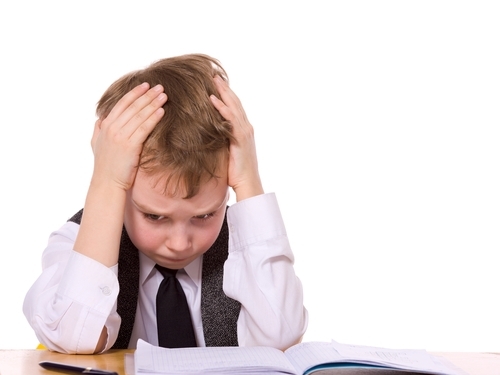 Math homework blues can be beaten by just these 4 steps. Peace of mind for you, fun and engagement for your child.